The Bernina Express trains cross the Swiss Alps twice in Graubünden on the UNESCO-listed Albula and Bernina railways with 55 tunnels and 196 bridges. The luxury Bernina Express trains with panoramic window wagons connect Chur and Davos with St Moritz via the Albula valley and tunnel before making the highest regular railway crossing of the Swiss Alps without using tunnels on the way to Tirano in Italy. 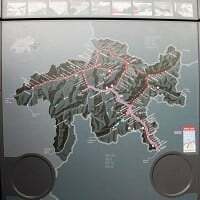 The Bernina Express Bus provides a useful connection to Lugano in Ticino. Budget travelers can save by using the regular Rhaetian Railways trains on the same tracks. The railways used by the Bernina Express and other Rhätische Bahn trains are from the golden age of railway engineering. These civil engineering masterpieces were completed during the early 20th century in a way no railway would ever be built today. The Albula line was completed in 1904 and uses 42 tunnels and 144 viaducts and bridges on the 67 km route from north of the Alps to the Engadin Valley (Inn River). In the process, the trains make six almost circular turns – mostly inside tunnels carved into the rock face of the steep valley – and endless switchbacks to climb 400 m in altitude over a distance of around 12 km from Bergün to Preda. A final near 6 km tunnel sees the trains emerge into the Upper Engadin. The Bernina Line was completed in 1910. In 61 km, 13 covered galleries and 52 viaducts and bridges allow regular trains to pass through the 2253 m high Bernina pass before descending 1140 m in less than 20 km to Poschiavo. The line terminates in the Italian town of Tirano after the spectacular circular viaduct at Bruscio, where the train makes a full circle to climb the maximum in the smallest space possible. En route, the Bernina Express trains literally pass glaciers and snow on its way to the palm trees of Italy (and Lugano if continuing the journey on the Bernina Express bus to Ticino in southern Switzerland). The Bernina Express trains with luxury wagons featuring panoramic windows operate year round, although the operating and reservation systems differ between summer and winter. In summer, early May to late October, trains to and from St Moritz run three times per day in each direction and once per day to Davos and Chur respectively. Reservations prior to boarding is obligatory – CHF14 per seat. In winter, one daily Bernina Express train connects Chur and Tirano in each direction. Travelers from St Moritz may join the Bernina Express at Pontresina and from Davos at Filisur. However, more interesting for travelers in winter is that Bernina Express panoramic cars are attached to the regular regional trains operating between St Moritz and Tirano and St Moritz and Chur. In such case, using the luxury seats requires no reservation but a surcharge of only CHF5 is payable. The “express” in Bernina Express refers to the limited number of stops that the trains make – regular regional trains use the same tracks but stop more frequently. The exact stations at which the Bernina Express stops depend on the specific train. All trains stop at Poschiavo at the lower reaches of the valley and most stop at Alp Grüm, Ospizio Bernina, Pontresina, and St. Moritz. From Tirano, the special Bernina Express Bus provides a majestic three-hour journey via the Veltlin (Valtellina) Valley and the shores of Lake Como to Lugano in Ticino (Tessin), Switzerland’s only Italian-speaking canton. The bus runs once per day from early April to late October. The Bernina Express Bus can be taken independently from using the Bernina Express trains and requires a separate reservation. The price of tickets for the Bernina Express trains is the same as for regular regional trains operating on the same tracks. However, seat reservations are essential for using the panoramic cars of the Bernina Express. Seat reservations currently are CHF14 per seat – no discounts for children or any rail pass bearers. As a result, the Bernina Express is best used on longer journeys and regular Rhätische Bahn trains for shorter rides. Travel to Poschiavo is around CHF8 cheaper. Return fares are simply double single tickets. Children 6 to 16 pay half the regular fare but if traveling with parents or grand parents, a Junior Card may be far better value. All regular Swiss Railways passes and discount cards may be applied but the reservation fee is always payable in full. The Bernina Express, like all trains in canton Graubünden, is operated by the Rhaetian Railways (Rhätische Bahn), which is legally separate from Swiss Railways (SBB), but for travelers it makes no real difference. All Swiss Railways tickets and passes are valid and tickets can be bought at any outlet selling Swiss transportation tickets, e.g. SBB. Several British travel agents specialize in train travel and have package deals cheaper than booking various trains and hotels separately. Some of these group journeys use train travel from Britain to Europe while some fly travelers to Switzerland. Swiss railway passes and train tickets can also be bought in the USA from RailEurope – exchange rates and foreign credit card charges can sometimes make a difference in prices. 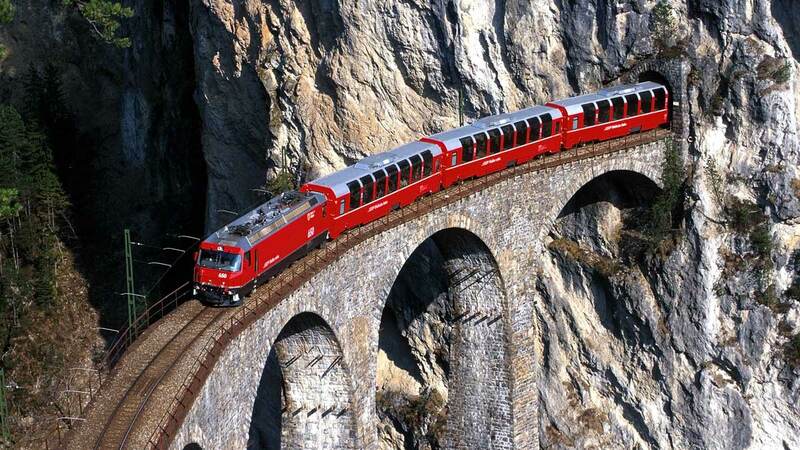 Savings Tips when Traveling on the Bernina Express – very few of your Swiss traveling companions are paying full fare!